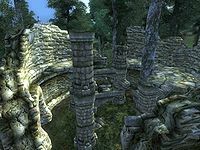 Fort Roebeck is a medium-sized fort south of the Imperial City containing conjurers. 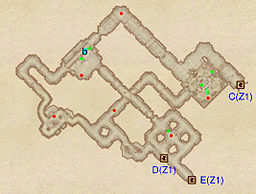 It contains two zones: Fort Roebeck and Fort Roebeck Winter Station. The first zone of the fort contains a small figurine of Clavicus Vile and his hound. 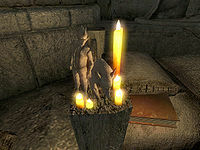 You can find the figurine standing on a bedpost next to some candles. This location's map marker (M on map) is named Fort Roebeck (editor name FortRoebeckMapMarker). The entrance door is SE of the marker, 120 feet away. 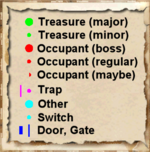 Fort Roebeck is low on both enemies and treasure, and exploration can be quite confusing due to the many paths available from the very start; soon after entering you will reach a flooded room with a locked door (F) and a raised drawbridge at G. Ignore the water and the door and lower the bridge by activating the handle (cyan dot on map) and proceed forward; the next area contains several bedrolls and beds (all marked with b), the figurine of Clavicus Vile on a bedpost and a weak poison of slowing. Go up the stairs and avoid the path to the right, as it will lead you into a rain of Darts and nothing else. 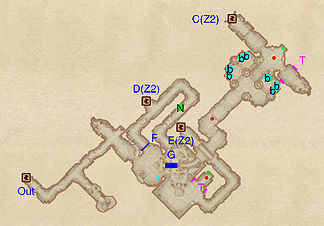 Instead, take the path to the left and enter Fort Roebeck Winter Station through door C.
You will return to this zone through door E; head over the bridge and follow the tunnel as it bends, leading to the balcony surrounded by statues. There is only one minor loot chest to be found, but beware the Dart trap at T. Finally, jump over the fence and all the way down into the water. Find the only available tunnel, claim the Nirnroot at N and proceed forward, ignoring door D, which leads to an empty area in the Winter Station zone. Unlock door F using the Roebeck Bridge Room Key and backtrack all the way to the exit at Out. For the most profitable and effective exploration of this zone, you will have to be creative; upon entering from door C, you will find yourself on a balcony overlooking a chamber with a bloodstained altar guarded by a Conjurer. Jump down into the room and dispose of the guard, then claim the Roebeck Bridge Room Key from the altar (k) and the contents of the nearby chest. Follow the only available path and keep following it in a clockwise direction (ignore the path leading south towards door D) until you reach a bridge, elevated above a Sacrificial Altar (b). Jump off the bridge and fight the lonely guard, claim the treasure from the two chests and locate the only available path, leading to door E and an entirely new area of the first zone, Fort Roebeck.